While going through my pictures, I could not help but remember this flight. That outer ring of 13mm motors burned out too quickly for my taste. In the last shot of the second group, there appears to be something falling away from the model. I don't think it's an artifact of the camera. Looks like a clip whip. The item is circular, and is about 12 to 18 inches below the base. Any idea what it might be? What you see is one of the three standoffs between the middle of the white cylindrical section and the launch rods. You can see them fall away in the preceding shots. FWIW - Photos of Chris Flanigan's N-1 at he 2010 World Space Modeling Championships (WSMC). Built very lightly, and powered by six C6's. Photos by me. After flight, Chris with US Team Manager John Langford (John is one of the new owners of Estes). What keeps that thing stable? Conical Stability, as in the Centuri's "The Point". In this case a complex set of stretched cones. Key being that it had enough nose weight to be sure the CG was sufficiently ahead of the CP. Now Chris’ model did have simulated scale “Grid Fins”, but those were not big enough and almost certainly not shaped properly like real grid fins to provide much added stability. Also, horrible Reynolds number scaling effects (grid fins might have bene 1/60 or whatever, but the air molecules were not scaled down). And this assumes Chris would have made “scale” cross-section grid fins and not the more expedient method of using some existing screen mesh to simulate the appearance. 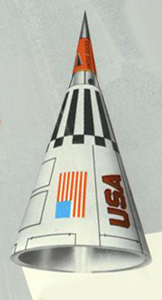 Below, what the real N-1 grid fins looked like. Well, mounted differently. Not like a screen or a mesh, the grid fin slats are thin but very deep. When unflown N1 #rocket's were broken up, parts were repurposed by Baikonur locals. 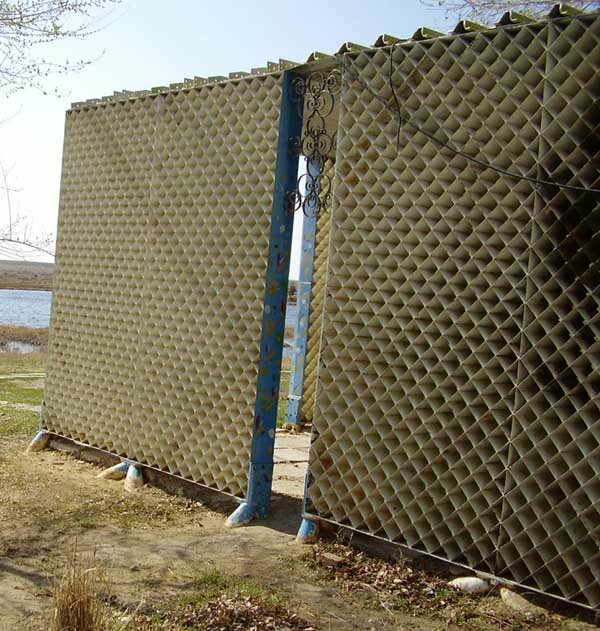 Like these grid fins, turned into a shelter. Ah, note how you can't see thru those grid fin slats from a diagonal view (like you would looking thru a chain link fence). Then I looked at the post-flight photo of Chris, and on the left side the grid fin assembly has a lot of sunlight shining thru it at a sharp diagonal angle. So those must have used something more like a mesh/screen, otherwise scaled slats would have blocked the light at that angle. Last edited by georgegassaway : 04-30-2018 at 09:32 PM.